Lincoln had high expectations when it launched the Continental Mark III in mid-year 1968. Another manufacturer had dominated the personal luxury market for years, and Lincoln figured only a spiritual successor to the world-class 1956-57 Continental Mark II would be able to restore the marque to its former glory. Despite the name, the smaller, sleeker Mark III shared almost no parts with the standard Continental coupe and sedan. The body was completely unique, mounted to a modified Thunderbird perimeter frame. Power was from a brand-new 460-cubic-inch V-8 good for 365hp and 500lb-ft of torque to hustle the nearly 5000-pound Mark III with authority. But opulence and exclusivity were its real advantages. The Mark III remained in production through 1971 and 1970 was the first year for concealed windshield wipers. It is the model year the Automodello has chosen to render as a premium 1:24 curbside resin-cast model. The standard model is a Medium Aqua Metallic with a maximum production of 150 units. And the Homage Edition in Black is limited to just 24 units. All are hand-numbered and officially licensed by Ford Motor Company. I found these models to be very nice eye candy, any die cast collector would be proud to display any of these in their collection. The paint on all three was flawlessly applied and as smooth as a baby's bottom. I constantly am asked the question which color do I like best? Honestly, I would say anyone of them works for me. As I got to fondle them during the photo shoot each one grew on me more. I would recommend anyone of them based on color; they all work and know how to flaunt their wares. 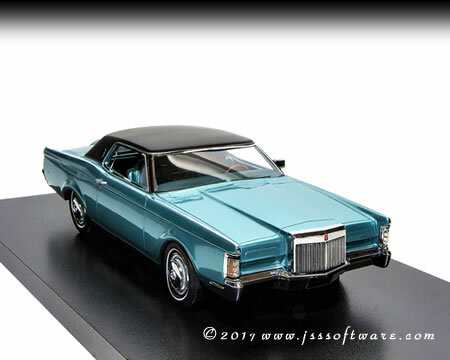 Just like previous Automodello releases the 1970 Lincoln Continental Mark III was very well executed with attention to detail. One thing I would mention is there is a lot of foil used on these models so you don't want to dust them down with a cloth as you will definitely damage the foil used on all three models. I would only clean these models with a very soft brush, like your wife�s makeup brush would work perfectly. 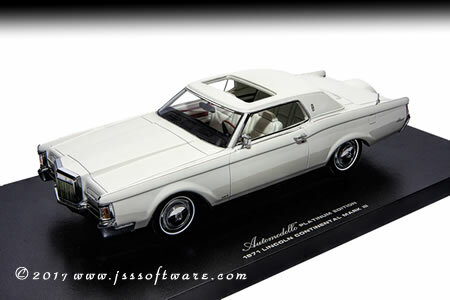 The interiors on the Automodello Lincoln's are fully detailed and accurately replicated. 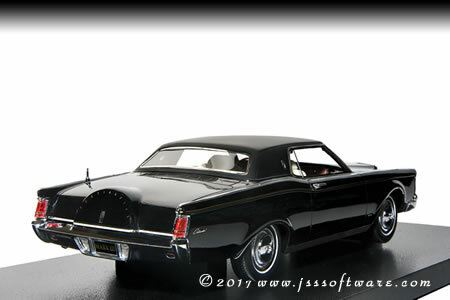 Changes made to the interior from the '69 model were few, the metal horn ring was deleted and replaced with a Rim Blow unit, the ignition switch was replaced with a locking steering column ignition switch. The interior wood appliques were upgraded to genuine walnut. Door panels were redesigned and power seat controls were moved from the seat edge to the door arm rests. A power sliding sun roof joined the options list and is included on the Automodello Platinum Edition only. Personally I like this option on the Automodello model; it affords me the opportunity to appreciate the interior detail completely. The exterior changes on the 1970 Lincoln Continental Mark III over the '69 model were minor also. The vinyl roof was now standard, windshield wipers were now concealed, and the wheel covers were redesigned. Michelin radial tires were now standard equipment. Under the hood the horsepower remained unchanged 365, emission controls were becoming mandatory and the "Thermactor" air injection pumps were mandatory on the 460's. Motor Trend's 1970 head-to-head review featuring the Cadillac Eldorado vs. the Lincoln Mark III gave the nod to the Lincoln, the comparison began the annual Motor Trend "King of the Hill" series. In closing you won't go wrong purchasing any of these models; Automodello has a winner, your color choice will be defined by how deep your pockets are, they all display nicely.